We know that breast cancer is one of the top 3 cancers diagnosed in Alaska. We also know that survival greatly increases when cancer is found at an early stage. For most women, predicting breast cancer risk on the basis of possible risk factors can be unreliable. Fully 70% of all women diagnosed with breast cancer had no known risk before the time of diagnosis. Bottom line? Follow recommended screening guidelines and get your mammogram every two years starting at age 50. > October 3 "Making Strides Against Breast Cancer" 11am at Delaney Park Strip in Anchorage. > October 17 "Health Forum with Dr. Pujari - Topic: Stress." Put on by the Juneau Cancer Connection. > October 13 “Breastival 2015” hosted by Alaska Cancer Care Alliance at Alaska Regional Hospital 6:00 – 8:00 pm. For more information call Niccele at 264-1500. > October 29 “Breastival 2015” at Valley Radiation Therapy Center 6:00 – 8:00pm. For more information call Diana at 792-1521. It's just one soda with dinner. What's the harm? That's the opening line of the new public service announcement (PSA) from the state's Play Every Day campaign to increase parents’ understanding that sugar adds up during the day. 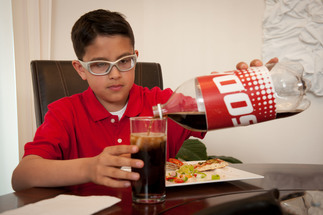 If their children drank a powdered drink for breakfast, a fruit-flavored drink for lunch, a sports drink for a snack, and a soda at dinner, they would consume 38 teaspoons of sugar that day — or almost a cup of sugar just from the drinks alone. The new message drives home the point that too much sugar adds up to health problems, including tooth decay, type 2 diabetes and weight gain. Since 2012, the Alaska Department of Health and Social Services, Division of Public Health has run the Play Every Day public education campaign to prevent and reduce childhood obesity in Alaska. 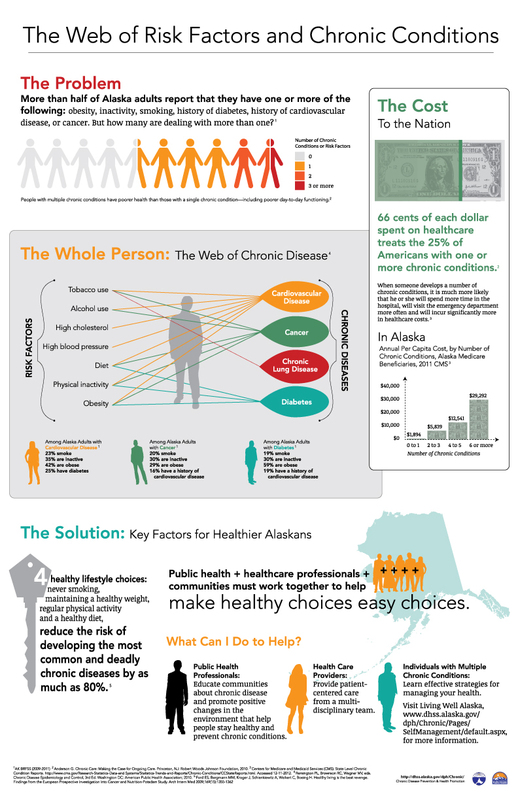 About 1 out of 3 children is overweight or obese in Alaska; 2 out of 3 adults are overweight or obese. Play Every Day creates educational messages for TV, radio, the Web and print that promote positive behavior changes to help maintain a healthy weight and improve overall health. The messages focus on getting 60 minutes of physical activity every day and choosing water, fat-free or low-fat (1%) milk instead of sugary drinks. Play Every Day launched its sugary drink message with three new TV public service announcements, online educational information and posters sent to hundreds of Alaska schools and health clinics. In September, the Play Every Day sugary drink campaign won the gold medal for public health education campaigns nationwide from the National Public Health Information Coalition. Play Every Day’s messages are reaching Alaskans and are beginning to make a difference in obesity-related health behaviors. Repeated surveys of hundreds of Alaska parents during 2014 and 2015 showed that after the sugary drink PSAs aired in communities across the state, there was a significant decrease in the percentage of parents who said they served their children one or more sugary drinks each week — particularly soda and fruit-flavored drinks. There also was a significant increase in the percentage of parents who said they provided more water to their children each day. Play Every Day is using several approaches to reach Alaska parents and children. Campaign staff mailed a new set of posters to Alaska schools; public health clinics; Women, Infants and Children (WIC) clinics; and health fairs. The posters are reminders about the importance of 60 minutes of physical activity each day and choosing healthy drinks. Staff also partnered with the Alaska Native Tribal Health Consortium to sponsor a Play Every Day PSA on television this fall and print posters using photographs that feature rural communities and Alaska Native families. Campaign staff sent these posters to schools and tribal partners throughout the state and posted them online here, under “Posters and Print Materials” and “5 ANTHC posters.” All posters can be downloaded at no cost from the Play Every Day website. Partners can request printed posters and other Play Every Day materials by emailing playeveryday@alaska.gov. This fall, Play Every Day also launched its second annual PSA video contest for Alaska elementary school children. To enter the contest, K-6 students need to work with a teacher or school staff member and film a 25-second video that will motivate Alaska kids and their families to choose water or low-fat milk instead of sugary drinks. Entries are due by 5 p.m., Friday, Oct. 30, 2015. Last fall, Play Every Day ran a similar contest asking for short videos that promoted daily physical activity. The campaign received 11 creative entries from seven schools in four school districts. A new set of short lesson plans that elementary school health teachers can share with their students will be available soon. The lesson plan will involve showing the campaign’s new TV PSA and using a pop-up poster to demonstrate that sugar adds up from breakfast through dinner, and this sugar can lead to serious health problems. The lesson plan also will include simple pledge forms for the students to fill out, committing to drink water or low-fat milk instead of sugary drinks. Last year’s lesson plans are online under the title “Enrichment Activities for Alaska Elementary Schools.” The new lesson plan will be published on this webpage later this month.